The Little Ranting Reptile and Other Stories....: Monet and Impressionism...at your friendly neighborhood Blogger! Monet and Impressionism...at your friendly neighborhood Blogger! You know why Blogger calls the Adsense feature as 'Monetize'? Monet was a great painter! He painted the Impression, Sunrise. This is the painting that gave Impressionism its name! Impressionist paintings or 'Impressions' are a rage at auctions. 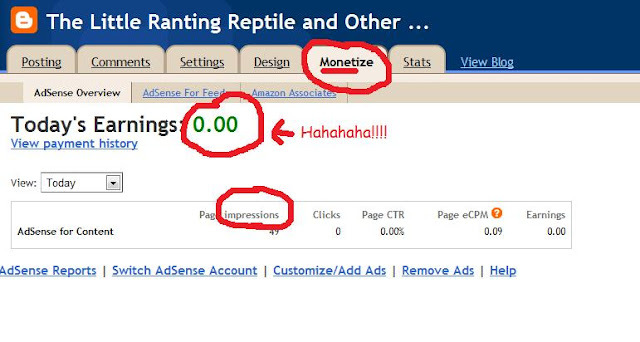 Blogger Adsense is just that! Auction of ads related to page Impressions! Still insist it is about money?